I wanted to make a milk based sweet for Diwali and thought coconut burfi made with milk would be a good idea. But, I wanted to kick it up a notch and thought I should make a double layer – half coconut and half chocolate burfi. So, I got started with grating the coconut and everything, and then another idea stuck me like a couple of nuts! Why not adds some nuts in here for a crunchy bite to the burfi. When I was all done, the burfi looked real pretty but the in between layer of nuts did not stick together well – I think I made a pretty thick layer. It did break apart easily – but who cares as long as you can eat all the three pieces together or separately! It tastes absolutely awesome and if you are a chocolate and coconut lover like me – you won’t go wrong with this one! You can add any dry nuts you prefer or anything that is available in your pantry. To start with, cut open a fresh coconut and cut the coconut into small pieces. Then, put it in a blender or a mixie and shred into real fine pieces. If you are using frozen coconut, do shred one more time to make it into real tiny pieces – this will just give you a nice consistency and will all stick together when cooked with milk. The coconut should be finely grated like this. For the nuts layer, I used pistachios, almonds and pecans – just because those were the ones I had at home. No other scientific reason! Give everything a whirrrrrr in the mixie and grind to a coarse powder. Now, take about ½ cup of sugar and also grind it in the mixie to make powdered sugar. Add this sugar to the nuts and mix well. Set this aside until later. In a wide pan, add a tbsp of ghee and when hot, add the coconut in there and fry for a min. Now, add 2 cans of evaporated and 1 ½ cans of condensed milk to this. Mix well and let this boil in a medium flame. You will need to keep stirring this so it does not stick to the bottom and also keep scraping the sides. You can see the different stages this go through as you keep stirring it. This does give your arms a good workout. Hey..if you are going to eat this - might as well burn some calories before that! When its almost done and you start getting a big ball out of it, just kind of divide the whole thing into two parts. Just draw a line with the spatula in the middle. Move one half from the pan to a greased plate. Flatten it all down so that its smooth and spread out. Now, to the other half, add the 1 tbsp of cocoa powder mixed with milk. Stir briskly to mix well with all the coconut burfi. This is absolutely divine - the cocoa give it that tinge of bitterness and I loved it! I would have just eaten all of this! Now, back to the greased plate filled with a layer of coconut, add a second layer of the nuts mixture and tap it down so that it clings to the warm coconut layer below. Add the third layer of chocolate coconut on top of the nuts. Press down one more time and smoothen it out with a spatula. Let this cool down for some time. After about 15-20 mins, take a knife and draw lines across the whole things to make little squares. Here's a close up shot of the burfi! Like I said, the nuts did keep falling off - but I did not care! It did taste real good. Maybe the next time, I should cook the nuts and have the sugar melt and then use that as a layer. Hmmm.. I'm sending this across as an entry to Priya's feast Diwali 2009 event. Thanks Priya for hosting! 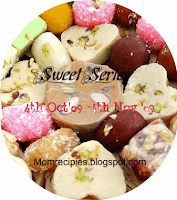 I'm also sending this to Sireesha's Sweet Series event. Thanks Sireesha for hosting! Also sending this across to Purva's Daawat Diwali Dhamaka Event. Thanks Purva for hosting! 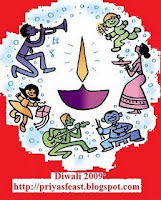 Looks awesome and Wish you and your Family Happy Diwali !!!!!!!!!!!!! Omg, such a droolworthy sweets, U guys seems enjoy making out many delicious dishes for diwali..Keep rocking..
the burfi looks really pretty, and must've made a great Diwali treat! Very nice recipe! I'm keen to give it a go once I've mastered the art of one simple caju or pista bufi. If your burfi is gooey, you're probably adding a lot of ghee while cooking it. Try this next time - add ghee just at the end of making the burfi and then pour it out quickly. Let it completely cool down to set. Maybe even move it to the fridge. And then try cutting it. Hopefully that works out for you.